222 Saratoga apartments are designed to fit your needs and enhance your everyday lifestyle. 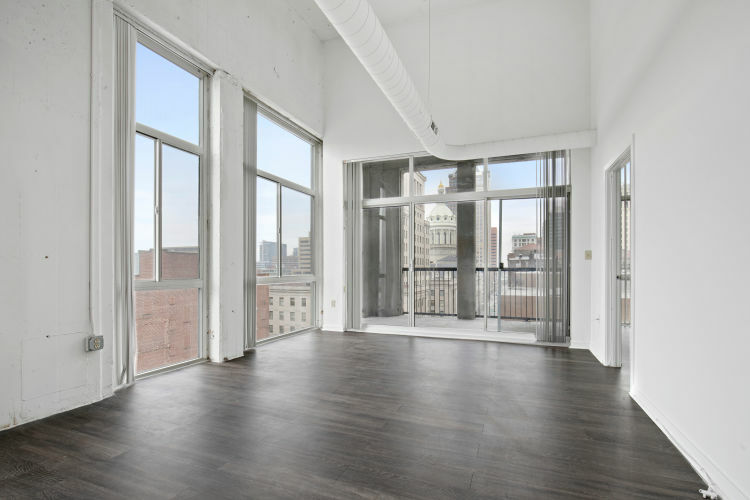 Each of our loft-style apartments for rent in downtown Baltimore offer spacious floor plans with modern upgrades throughout. Whether you enjoy a minimalist lifestyle and are looking for a studio or you need more room, like a two bedroom, 222 Saratoga has the perfect apartment for you. Indulge in beautiful kitchens featuring granite countertops, custom cabinetry, and stainless-steel appliances. Lounge with your pup on your private patio or balcony. And make laundry day easy with an in-home washer and dryer. You work hard. Enjoy your downtime at home at 222 Saratoga. We’re pretty proud to show off our loft-style apartments. Designed to give you the space you need and a space to feel inspired, our apartments help you find your happiness at 222 Saratoga. Walk into large, open floor plans with soaring high and vaulted ceilings, upgraded kitchens and bathrooms, and plenty of storage with walk-in closets. The chic hardwood floors give your space a polished look, and extras like soundproof walls offer you the privacy you crave. Settle in at 222 Saratoga. We know you’ll love it here. Not sure of the floor plan you’re looking for? We’re here to help. Get in touch with our friendly leasing team with any questions.